Featuring the voices of talents of Chris Pratt, Elizabeth Banks, Will Arnett, Tiffany Haddish, Stephanie Beatriz, Alison Brie, Nick Offerman, Charlie Day, Maya Rudolph, Will Ferrell, Jadon Sand, Brooklynn Prince, Channing Tatum, Jonah Hill, Richard Ayoade, Noel Fielding, Jason Momoa, Cobie Smulders, Ike Barinholtz, Ralph Fiennes, Will Forte, Jimmy O. Yang and Jorma Taccone. Scream it from the mountaintops: everything is *not* perpetually awesome, and that’s alright. Mike Mitchell’s The LEGO Movie 2: The Second Part reconciles importance between blind childhood optimism and life’s unforgiving stakes – hopelessness in a downbeat period – still managing to eke out sparkle-shiny themes bursting with reassurance, positivity, and appropriately unchill dilemmas that remind us life’s downs are as sweeping as its ups. The good news? Pendulums always swing back ‘round. 2019’s sequel might not once again build the same magic brick by brick, but that doesn’t stop this interlocking state of current affairs from being another splendiferous laugh riot for the whole family. Where The LEGO Movie mainly plays inside Emmet’s composite world, The LEGO Movie 2 expands into bigger tableless universes aka Finn’s (Jadon Sand) real-life household. Noticeable meta humor even in my brief detailer above is Mitchell’s bread and butter, since stairs leading from basements to kitchens double as sci-fi portals into other dimensions. Little sister Bianca (Brooklynn Prince) erects her own bedroom “Sis-Star System” where guards wield cake-pop weapons, and pretty-in-pink electro pop drowns out the desolation of Apocalypseburg. Stepping outside animated boundaries into live-action Lego representation leads to some cute gags – Emmet’s rigid “movement” under Mom’s (Maya Rudolph) dryer like a toy on a string – but wears thinner than the spectacle digitization of WB’s computer graphics team. Incorporating Finn and Bianca’s relationship overdrives an overarching message of unification. Compassion between a brother who wants to brood alone like Batman (Will Arnett) and the little ‘sis who just wants to play dance party. How easy it is to bottle angst and anger, shielding yourself from the world – the introduction of Emmet’s Mr. Hyde to his Dr. Jekyll in masculine time-traveler Rex Dangervest (also Chris Pratt) – when humanity is what saves us. Have we heard these outcries? Seen this story before? Undoubtedly. We’re groomed to become hardened, jaded, and unimaginative as we grow older – boys especially, hence Finn’s aggression – yet leave it to Emmet, friendship, and Bianca’s broken heart to bring sweet tears come the film’s grander realizations. Despite WNBA superstars and air duct cameos, The LEGO Movie 2 feels geared more towards younger audiences than its predecessor – still reference-laden and hilarious, nonetheless. Batman – dressed in a snow white Liberace costume – drops a grumbled rap verse about “Gotham Guys” (recounting Caped Crusader cinematic history), Rex’s many jobs (script butcher), toxic masculinity references an all, we’re still talking about a LEGO movie half rooted in Queen Watevra Wa’Nabi’s almost “Candy Crush” like kingdom. General Mayhem (Stephanie Beatriz) shoots baby-voiced stars and hearts from her spaceship that babble “I love you!” before exploding or vomit glitter after spinning dizzily. Humor is generally dialed-down for easy access – not to miss a needed “step on LEGO pain” joke, of course – which makes for a more pedestrian LEGO heartwarmer. One with welcomed musical numbers spit like fire from Haddish, a dead-on supporting voice cast including Richard Ayoade and Ben Schwartz, plus original earworms from Jon Lajoie (seriously, good luck shaking “Catchy Song”). 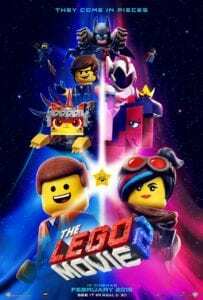 The LEGO Movie 2 boasts the same kind of revolutionary animation that made The LEGO Movie such a brilliantly structured optical blitzkrieg, says all the right lines, and charms the pants off viewers in every expected way. Born from the pixie-dust dreams of toddlers, sharpened through a cinephile’s lens. Not quite as impactful as WB’s first LEGO showstopper – hence my usage of the word “expected” – but it’s still plenty worth feeling Emmet’s warm glow emanating from scenes like a hug. Come for the razzle-dazzle, stay for the space raptors, leave feeling a sense of hope that terribleness will pass in time. Heaven knows we need some of that energy in 2019.